- Prevents hair fall and stimulates an Unbelievable growth of hair. - Stop Premature Graying of hair. Owing to our state-of-art manufacturing unit and the usage of cutting-edge techniques, we are able to present a comprehensive range of Ambery Hair Oil. Ambery hair oil is an herbal hair tonic to nourish scalp and brain. It protects our hair from the damaging effect of the sun. Indication: Migraine, Giddiness, Premature greying and falling of hair. A good tonic for the growth of the hair, used for oil bath and daily hair dressing. This hair tonic quick relief from stess and helpful in sound sleep. It increases your memory power and makes your hair lustrous and soft. 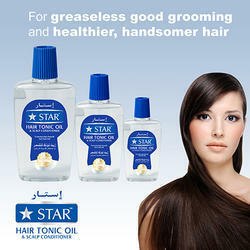 We are counted amongst the foremost manufacturers and exporters of a wide range of Hair Tonic. The tonic is acknowledged to prevent hair fall and hair splitting, while accentuating the growth of shiny hair. These are formulated using top quality chemicals that are procured from reliable vendors in the market. Clients can avail these from us at reasonable prices in the market. Hair Nourishing Serum is a non-oily potent formula which acts dually on the hair. When massaged on the scalp, it penetrates deep to the hair follicles and nourishes the hair roots thus making the hair nourished, strong and healthy. When applied on the hair length, detangle the hair and adds luster, sheen and volume to the hair thus giving it excellent softness and conditioning.